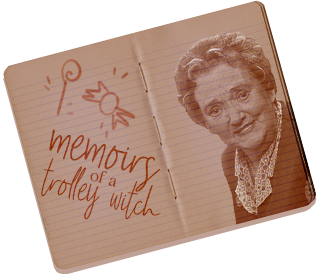 TROLLEY WITCH: People don't know much about me. They buy my Cauldron Cakes - but they never really notice me. I don't remember the last time someone asked my name. SCORPIUS: That's - one hundred and ninety year. You've been doing this job for one hundred and ninety years? The Trolley Witch. Silently serving the Hogwarts students sweets and pastries to pass the time on the Hogwarts Express. Little is known about this dear, old lady... that is, until two students try to hop the train. - How has she been living for over 190 years? - What does she do to turn her pastries into weapons? - Why does she feel so protective of the students on board the Hogwarts Express? Feel free to explore these questions and your own. Along with your entry, please include a word count at the bottom. - Entries must follow all HEX rules and guidelines. - Your work that is not your own will not be tolerated and will result in disqualification. - Each person who participates will gain one (1) ticket to March's Book of Records. - Entries will be judged by the Magical Archivists based on creativity, entertainment, and use of prompt. - Please owl your entry to The Time Turner by 11:59 pm on February 14, 2018 HEX time. - If you have ANY questions or concerns, feel free to post in this thread or Ainsley. Please post your tradelinks here for your galleon prize. Here is also a ticket list to the Book of Records. All valid entries earned a ticket. Oh, thank you! I never expected to win a prize! Congratulations to the other winners! Great, thanks! 1000 points to Slytherin! Thank you for the contest, it was interesting to write. Grats to the other winners!